Click here for the 2013 Grant Application! SVBC will award 5 grants to local businesses to assist with the purchase and installation of bicycle racks for employees and patrons of the business. 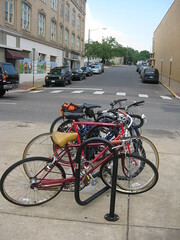 The grant will provide 75% of the retail price of the bicycle racks with a maximum award amount of $500 per grant. The grant will also cover cost associated with shipping, installation, and necessary hardware to securely mount the bicycle rack. Applications are due May 25th, 2013.
Business must be located within Harrisonburg city limits. Do not block fire escapes, fire lanes, or other such emergency access. Do not impede pedestrian flow or accessibility for people with disabling conditions. Any remaining balance must be paid by applicant in check or cash to “Shenandoah Valley Bicycle Coalition” prior to installation of the rack. Applicant agrees to clear racks of snow within 24 hours of snowfall in excess of 2 inches. If the applicant’s business changes location, rack must remain installed at its original location unless SVBC Board gives approval to relocate the rack in advance. 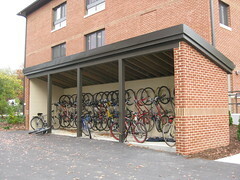 Participants must maintain and indemnify received bike racks in a suitable location as described above for a minimum of five years after installation, and respond to survey questions on the status and usage of the bike racks. 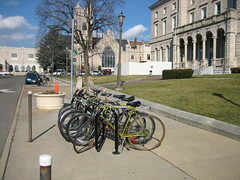 Removal of any bike rack less than five years after the date of installation will require the applicant to reimburse SVBC for the full dollar amount of the award. 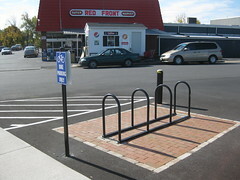 The bicycle racks available through this grant are shaped like the rack pictured on the left. Each loop accommodates two bicycles. The grant offers any combination of two-loop, three-loop, and four-loop racks. I Want to Install a Good Bicycle Rack and Could Use Some Help Selecting The Location. Can someone help me?